Nilay Duruk Mutlubaş received her BSc degree from Istanbul Technical University in 2004. She completed MSc and Ph.D. degrees in mathematics in Sabancı University, in 2007 and 2011 respectively. Her doctoral thesis is entitled “Cauchy problems for a class of nonlocal nonlinear bi-directional wave equations”. She, later on, held a post-doctoral position in the Faculty of Mathematics at the University of Vienna, Austria. Her study there was focused on mathematical analysis of the nonlinear partial differential equations, modeling the evolution of the free surfaces for waves of moderate amplitude in the shallow water regime. She worked in the Department of Basic Sciences in Altınbaş University between 2013 and 2017. Since September 2017, she works as an assistant professor in Faculty of Engineering and Natural Sciences at Sabancı University. 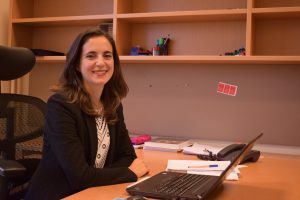 Her research interests are mainly on mathematical analysis of the model equations arising in partial differential equations, in particular dispersive wave equations and analyzing their qualitative properties using some functional analytical techniques.